Foldable display phones may be here sooner than we might have imagined – and change computing on-the-go for good. Yet, have any of these been improvements that fundamentally change how smartphones look and work? Or for the matter how we use them? To be honest, the futuristic iPhone X, the Infinity Display clad Samsung Galaxy S6 edge, or even the much talked about OPPO Find X have all been devices cut from the same cloth, offering, in essence, the same possibilities that a rigid metal and glass slab can offer. But, it appears that things may be about to change. After a wait of over a decade, smartphones may well be ready to plunge headfirst into a new and exciting future. One where they will be more than just slabs of glass and metal – maybe even more than smartphones as we know them today. And central to this could be the entry of a new display technology for phones – one that has been in the works for quite a while now, but likely to become the next big thing in 2019. 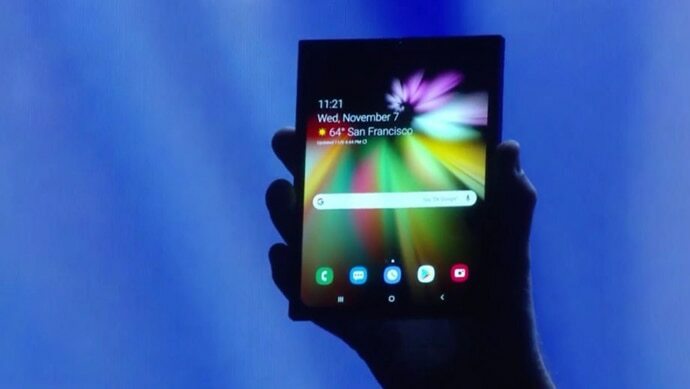 South Korean smartphone maker, Samsung, at its developer’s conference last week showed off what may very well be the world’s first foldable display phone. Although the device has no name yet, what we do know is that it will have a form factor of a current day smartphone that will open up to turn into a full-fledged tablet. Samsung has revealed that the phone will come with two displays. The main 7.3-inch foldable panel boasting of a resolution of 1536x2152 – and slightly unusual aspect ratio of 4:2:3 – will be fitted inside, while a second 4.58-inch 840x1960 resolution display will be found outside when the phone is folded to assume the form of a conventional smartphone. Another important thing to note is that because of this being a foldable device, Samsung has explained that it would not be using glass or metal on it. Rather, it will use a new polymer that it claims will be both flexible and tough. The device was shown off under dimmed lights to protect the elements of the design leading us to believe that it could very well just be a concept for now, and as such significant changes may be seen by the time it finds its way to the mass market. Talking of which, reports suggest that Samsung is aiming to launch this new phone as part of an all-new Galaxy F series that will feature its new foldable phone technology – the Infinity Flex display. And with Samsung SVP of Mobile Product Marketing, Justin Denison announcing that Samsung is mere months away from mass production of such displays, our guess is that we should have these phones in stores much before the end of the first half of 2019. But Samsung is not the only brand that’s edging ever so close to making the long-promised dream of foldable display phones a reality. Samsung’s biggest rival from its home country, LG, has also filed patents for a phone with a foldable screen. 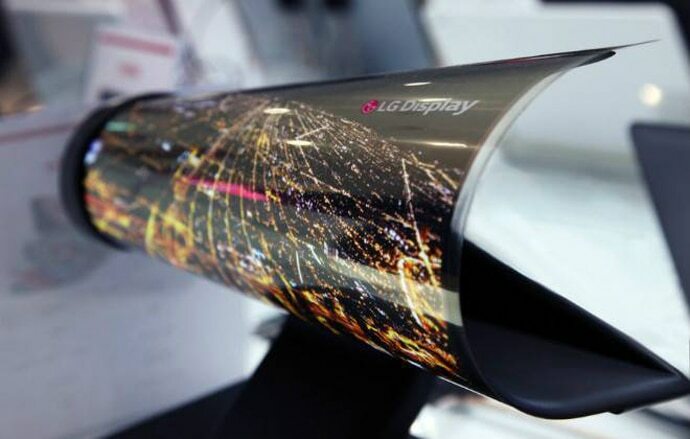 Considering that LG is one of the leading foldable display manufacturers, and has already shown working prototypes of such displays – although not on a phone like Samsung – it will come as no surprise if it soon announces a phone with such a display. Another company that is working on a phone with a foldable display is Huawei. The device has already been confirmed by its CEO, Richard Yu who confirmed in October that this particular device will be foldable and also support 5G. Interestingly, this device is being rumoured to use LG made foldable displays. 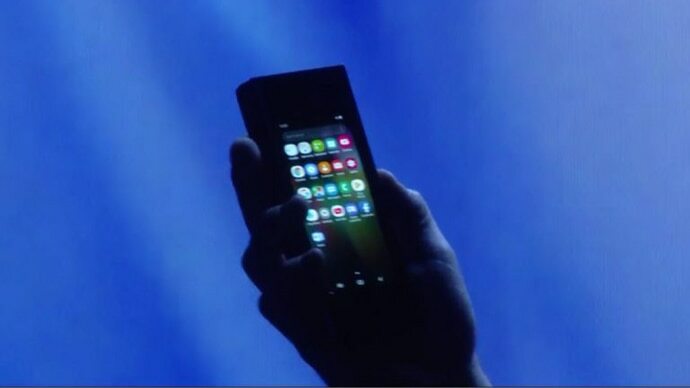 Although it’s true that phone makers have been toying with the idea of foldable display phones for quite some time now – Samsung showed off its first prototype in 2011 – the fact that the technology is close to becoming a mass-market reality is enough to get us excited. But if you need more convincing, sample the idea of how foldable display technology opens up smartphones to an era of endless possibilities. Though it may sound convenient to strike off such phones as the latest gimmick by smartphone makers, the reality, however, is nothing like that. By their very nature, foldable displays could solve major design bottlenecks that modern day smartphones face. Take for example the Samsung foldable display phone, which because of its technology would provide the solution to the problem of carrying around a hefty tablet. Because it can be closed like a book when not in use, and still be used as a normal phone because of its secondary 4.58-inch display, this device would represent an interesting option to users who carry around a tablet or – even a laptop – for differing use case scenarios. Talking about laptops and notebooks, as The Verge reports, one of the biggest names in computing technology, Intel, is already working on a similar foldable device which it believes could be the future of on-the-go computers. Being developed under the codename, “Copper Harbor", Intel is developing a dual-screened device that can double up as a full-fledged PC. Though not quite pocketable, and not boasting of a single foldable display, the device, will be thinner and smaller than the most manageable laptops and notebooks out there – all without compromising on the power and functionality portable computers offers. 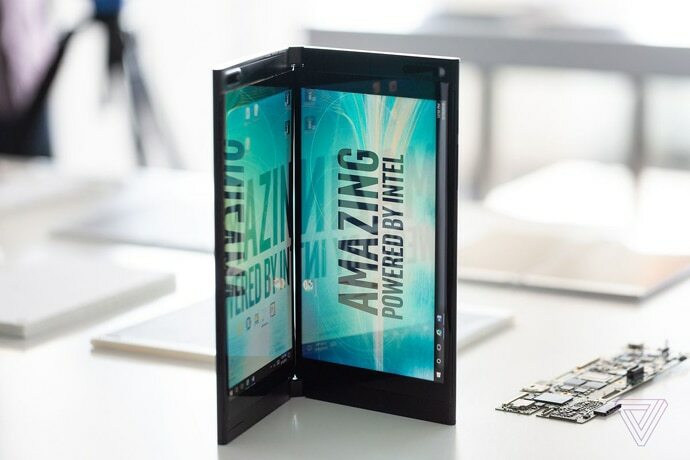 With foldable displays soon to become a reality, who is to say that Intel may not use one on the “Copper Harbor” in the future instead of using two separate panels as its doing now. When this happens, it will also change the way portable computers work. It will lead us to a strange intersection where computers and smartphones will truly come together. An intersection where a smartphone will cease to be just a smartphone meant for making calls, playing the occasional game and staying connected to the internet. By overcoming the bottleneck of its current day form factor, smartphones would truly evolve into computers of the future that will snug into our pockets. Having said that, there are design issues that will need to be circumvented before such devices become real. After all, fitting rigid hardware – battery, circuit boards antenna etc – inside a bendable phone is no easy task. Yet, with the display technology now close to being mastered, these should prove only to be temporary roadblocks that should soon be overcome. Positive signs are already to be seen. Even before the first wave of these devices hits the market, Google has officially announced support for a new category called “Foldables.” It has started working closely with Samsung and other phone makers to help ensure a smooth transition to this next wave of technology. As such, the era of foldable phones may be here sooner than we might have imagined. 2019 could very well be the year that foldable display phones make their entry – and change computing on-the-go for good. Also read: IBM announces the world's fastest quantum computer - what does it mean?